Rhododendron (from Ancient Greek ῥόδον rhódon "rose" and δένδρον déndron "tree") is a genus of 1,024 species of woody plants in the heath family (Ericaceae), either evergreen or deciduous, and found mainly in Asia. It is the national flower of Nepal. Most species have showy flowers. 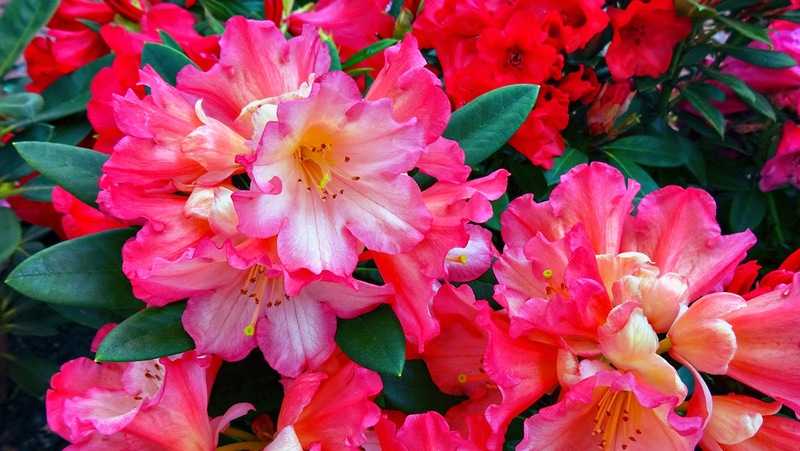 Azaleas make up two subgenera of Rhododendron. They are distinguished from "true" rhododendrons by having only five anthers per flower. This variety is "sierra Sunset" and the flowers combine red, yellow, orange and cream colours in a spectacular blend. This hybrid was cultivated by the late Jack Lofthouse. The foliage is dark-green and lustrous on a dense full shrub. Height 1.3m, and flowers October (Southern Hemisphere). Interesting facts! Thank you for sharing it and for hosting this wonderful challenge! Interesting to read! So beautiful flowers! Amazing colors - very beautiful! Sierra Sunset is a beauty Nick. Rhodos do very well in the cooler parts here. I'm planting some Azalea Mollis varieties at present as they do well where I live. Once we rented a house in the forest of Holl. for one and a half years, and it had a huge (a good 7 feet) rhododendron bush on the side. I had forgotten how beautiful these flowers are! Thanks for posting and hosting! How beautiful So good to always be able to see your pictures enlarged. I never knew that about the number of anthers always being different between rhodies and azaleas. Lovely variety! Also, new facts for me! Very pretty indeed, Nick. :) Happy weekend to you.